As fuel prices continue to rise, many drivers are looking for ways to improve the gas mileage of their vehicles and stretch each tank as far as possible. Fortunately, there are a number of tips and tricks that have been proven effective time and again that you can use to help squeeze a few more miles out of each drop of gas. The U.S. Department of Energy maintains an extensive website at www.fueleconomy.org/feg/drive.shtml dedicated to helping American drivers maximize their gas mileage. One of the most effective methods of improving fuel economy is to change your driving habits in a number of small, but important areas. First, it’s important to make sure that your car isn’t carrying anymore of a load than necessary. This means that you should clear out your trunk or hatch area of any items that might have accumulated there over time. This can include sports equipment, old toolboxes and even snow scrapers that have hung around well into the summer months. Every 100 pounds that you can pull out of your cargo area can save you as much as two percent on your fuel bill. Another driving tip involves momentum and smoothness. Gasoline engines are most efficient when maintaining a constant speed, which is why fuel economy typically goes up during highway driving. Keeping your speed as consistent as possible on the freeway, by avoiding speed-ups and slow-downs, will go a long way toward extending the range of your tank of gas. Around town, where stops are unavoidable, gradual acceleration versus stomping on the gas from streetlight-to-streetlight will have a similar effect on lowering fuel use. In both cases, it’s also important to keep in mind that slower speeds equal reduced gasoline consumption. You might be able to get away with not getting a ticket, but you can never escape the extra fuel used by high rpm driving. Properly maintaining your car can also help reduce your gas use. Underinflated tires can rob you of as much as 3.3 percent of your automobile’s fuel mileage rating, according to U.S. Department of Energy figures. 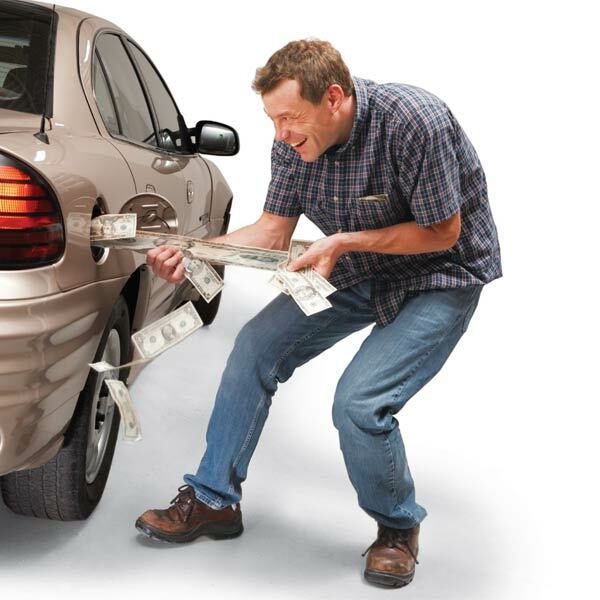 Matching your tire inflation to the number listed on the door sticker is a great way to help save gas. Using the correct viscosity oil for your engine – and changing it at the factory recommended intervals – can additionally play an important role in keeping your motor running at peak efficiency. Information on correct viscosity is located in your owner’s manual. If you can’t find it there, visit your dealership’s service department and ask the experts. While a two to three percent increase in fuel economy might not sound like much, using each of these tips in conjunction with each other over the course of a year can add up to hundreds of dollars in savings at the gas pump. With the summer gas price surge just around the corner, every little bit of extra fuel efficiency can help keep more money in your pocket. These tips are sure to help, but it’s all for naught if your car isn’t running at its peak efficiency.